Got a building washing need? We are pros at restoring building exteriors! High pressure is not always the answer for exterior cleaning. When washing stucco, cast stone and organic growth demand soft washing! 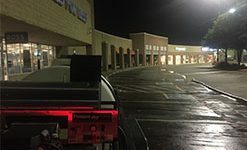 Are you a property manager needing some pressure washing at one of your retail locations? We offer after hour service and can custom build a cleaning package to meet your needs and budget! We are very experienced in restoring neglected concrete surfaces. We utilize hot water and specialized cleaning solutions to get the best results for our customers! Your DFW Commercial Pressure Washing Experts! Soiled building exteriors get rejuvenated and restored with our commercial building pressure washing service. Avoid expensive repairs! 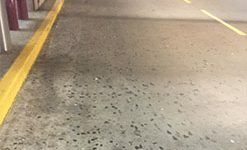 Neglected sidewalks and entrances get renewed with our retail strip pressure washing service. Spills, stains and bubble gum are no match for us! 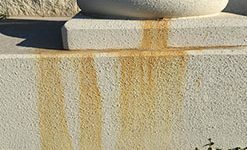 Neglected concrete surfaces are no match for our experienced pressure washing technicians and professional grade equipment. If you demand results, call us today! Soft washing is a low pressure solution based cleaning service that cleans delicate surfaces without damage. Avoid damaging stucco, cast stone and more! Extreme bubble gum buildup is no match for our hot water units. We can remove those unwanted “black tar balls” from your surfaces efficiently. You do not have to live with rust stains around your business or property anymore. Our rust stain removal service is effective and affordable. 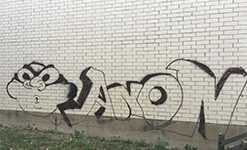 Graffiti is an eyesore and no matter how or why it got there, we have a professional removal solution for most surfaces that will avoid costly repairs. Organic growth and mold can be safely removed from all surfaces with our knowledge of cleaning solutions and ability to soft wash. Avoid damage from high pressure! Commercial pressure washing jobs are our specialty. We offer a comprehensive list of pressure washing services to tackle any need that might arise. If you have a commercial pressure washing need, we have a washing solution for you. Our equipment is professional grade and our results speak to that! One call cleans it all! Are you a property manager looking for a company to take care of your pressure washing needs? Look no further, we are the pressure washing company for you that offers one time cleans, bi-weekly, monthly, quarterly and semi-annually cleaning packages that are built around your budget and needs. Do not go another day with bubble gum covered sidewalks and years of surface neglect! Contact Us Today to get your properties back on track! 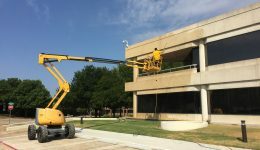 We are experienced in pressure washing all types of surfaces found on and around retail shopping strips, hospitals, medical buildings, and commercial buildings throughout the Dallas-Fort Worth Metroplex. If you have a commercial pressure washing need, we have a wash solution for you. 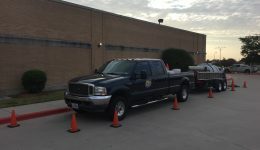 We pride ourselves in being able to handle all types of pressure washing projects ranging from a simple retail storefront to a 100,000 sq ft parking lot. If you are in need of pressure washing service and desire professional results, look no further. We are a locally owned, owner-operator company. Ready to get started? Call Us Today or Click here for a fast, no hassle, no pressure cleaning quote. 214 Pressure Washing is the real deal when it comes to commercial building washing! 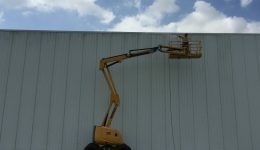 We have many years of experience washing hospitals, medical buildings and commercial buildings of all shapes and sizes. A professional building wash service requires a company with the proper equipment, cleaning solutions and experience. 214 Pressure Washing has everything needed to renew your building exterior safely and with noticeable results. Click here to learn more about Building Washing. Here at 214 Pressure Washing, we save our customers time and frustration with our pressure washing services. Our customers do not have to worry about anything when they select us for their cleaning projects. We have put in the time and effort to make sure we are safe, efficient and thorough with our services. Remember that when you choose us you are getting a professional, dependable and insured pressure washing company that is committed to producing the desired results for our customers. The pressure washing industry is very complex and to be successful you have to be able to wash surfaces with many techniques. Soft Washing is a solution based cleaning technique that utilizes high volume/low-pressure machines to wash delicate surfaces without damage. When washing delicate surfaces such as stucco and cast stone, demand Soft Washing! Remember that it is not Soft Washing if the water pressure coming out of the gun is too much to safely run your hand in front of it with no injury. Click here to learn more about Soft Washing. 214 Pressure Washing is a professional and experienced pressure washing company with commercial grade equipment. Our pressure washing units cost over $12,000 each for just the equipment. We do not offer pressure washing as a side service like many of our competitors. Pressure washing is all we do and we do it well! We have experienced technicians, professional grade equipment and belong to the pressure washing industry’s top associations. Everything about us is professional and our results are industry leading. If all you care about is getting the job completed for the cheapest amount possible, we are not the company for you. We believe in the saying “Quality isn’t expensive, it’s priceless”! 214 Pressure Washing is the #1 graffiti removal company in Dallas, TX. Although it is easy to spray graffiti on exterior surfaces, the removal of graffiti is not for the inexperienced. If you find graffiti around your property, call us for a no-hassle removal. We have many years of experience removing graffiti from brick, stone, playground equipment and signage. If you have a graffiti removal need, we have a removal solution for you. Click here to learn more about Graffiti Removal.